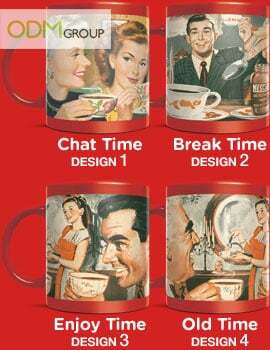 Nescafé goes back in time with their vintage custom mugs! Nescafé is a brand of instant coffee. It offers a wide range of products like Nescafé Black Gold, Nescafé Latte, Nescafé Cappuccino and many more. This time round, in lieu of Nescafé global 75th anniversary, Nescafé is offering a limited edition collection of mugs. These custom mugs come in 4 different designs. Each of these designs ties in to their current advertising campaign that revolves around a vintage theme. Keeping your brand name in front of customers and prospects is critical in growing your business. You have to find ways to make it easy for customers to remember you. Advertising in newspapers and magazines is one option, but often too expensive to do on an ongoing basis. Unlike those media advertising, a good and practical promotional product is also a good source of advertising. For instance, Nescafé custom mugs are unique, functional and can be used by customers for a very long time. It is a great promotional product with a long product life and high utility value. Besides that, customers who collect those mugs are also a source of direct advertising that would introduce Nescafé to their friends and family! Moreover, these custom mugs come in different eye-catching designs to make the most incredible advertising tool. By utilizing an outstanding design, that promotional product would be able to provoke interest and curiosity. This will encourage customers to take interest in your products and services. As a result, it will definitely boost brand awareness and brand recognition. Imprinted with your brand name and logo, these custom mugs would continue advertising and reminding people of your product even long after it has been received. So what are you waiting for? Start customizing your mugs today!